Here's your "Revenge of the Sith" review in a nutshell: It may well be the best of all six "Star Wars" movies -- with the caveat that you need to have seen the other five films to truly grasp its significance. The cunning dexterity and gravitas with which George Lucas snaps into place every remaining puzzle piece in his epic 30-year story arc is remarkable. The talent of Hayden Christensen will surprise his detractors as he portrays a complex, compounding crisis of conflicting loyalties that tear Anakin Skywalker apart, leading him to slip ever more rapidly toward the Dark Side of the Force. The potent sensations of betrayal and inevitability that fuel the climactic duel between the young Jedi knight and his former master Obi-Wan Kenobi are positively goosepimpling, even though every "Star Wars" fan knows the outcome and has been waiting for this moment for years. These elements, coupled with much improved dialogue, far fewer scenes transparently designed to foster inevitable tie-in video games, and genuinely compelling emotions make up for the myriad of shortcomings that plagued the previous two "Star Wars" prequels. Opening in the midst the Clone Wars between the crumbling galactic republic and an alliance of separatists that is really a front for the evil Sith Lords (all those villains called "Darth This" and "Darth That"), "Star Wars: Episode III -- Revenge of the Sith" is surprisingly character-driven. 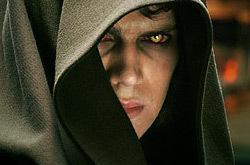 The plot revolves around the volatile, brash young Anakin being appointed by the increasingly powerful Chancellor Palpatine (soon to be revealed as Darth Sidious) to be his personal representative on the Jedi Council, which has for centuries tried to maintain peace in this galaxy far, far away. Having become something of an apprentice to Palpatine, he's also soon asked by Obi-Wan (Ewan McGregor) to report back to the council on the chancellor's activities, a request Anakin sees as duplicitous, especially since the Jedi are becoming embroiled in their own discord over compromising values. Genuinely trying to do the right thing, he seeks advice from Yoda, but this wisest of the Jedi Masters unknowingly makes Anakin's confusion worse, as do the disturbing visions he's been having of Padmé (Natalie Portman), his secret wife (Jedi are sworn to celibacy), dying in childbirth. When Palpatine promises that Anakin can learn to save her with powers from the Dark Side of The Force -- the energy that binds the universe together in "Star Wars" mythology -- actor Ian McDiarmid is so brilliantly convincing in his iniquitous manipulations that Anakin's fateful choice actually seems to make a good bit of sense at the time. "Episode III" is built upon dangerous choices with dangerous consequences. Although riddled with a handful of minor problems (Yoda's goofy backwards diction has become distractingly acute), a few larger ones (once smart and self-reliant, the now-pregnant Padmé has been reduced to fretting endlessly about Anakin's ever more ominous behavior), and a couple "what was George thinking?" moments (Obi-Wan rides a giant lizard), this movie delivers on the promise of "Star Wars" with more than just incredible special effects and spectacular light-saber duels. Lucas magnificently sets the stage for the original "Star Wars" (which takes place 25 years later) by creating hauntingly iconic moments (a montage of Jedi knights being hunted down and killed), answering long-held questions (like how the Emperor's face became so hollowed and twisted), and actually plumbing his characters' souls for once. The showdown between the Anakin and Obi-Wan on the banks of a river of lava rends both their hearts as they trade pained accusations of betrayal and treachery, along with the saber blows that we all know will leave Anakin so disfigured he spends the rest of his life in Darth Vader's menacing black helmet and suit. But the finale of parallel tragedies that follows is the most heart-stopping moment in the entire "Star Wars" franchise. Lucas doesn't forget to have a little fun in "Revenge of the Sith," with, for instance, several callbacks to famous lines of dialogue from the original trilogy and a cool new cyborg baddie called General Grievous. He also draws striking parallels to current world politics (although Lucas can't help that the rise of the evil Empire he plotted out 30 years ago seems eerily familiar). But the heart of this film -- even more so than its sci-fi action and its complete immersion in Lucas's visionary universe -- is the tribulation of Anakin Skywalker's descent into darkness. It redefines the entire "Star Wars" saga to such a degree that even if "Sith" isn't universally considered the finest of the bunch, it is unquestionably the most pivotal.